As noted in a previous post (cf. Israel's Expectation, Sept. 2012), the opening genealogy of Matthew's gospel begins with God's promise about the "seed" of Abraham and the expectation of a promised Messiah to sit on the throne of Israel. Just as God's plan for His kingdom begins in Genesis with a promised "seed", so Matthew's Gospel begins with the fulfillment of that promised "seed", King Jesus, who brings a new beginning to the advancement and expansion of God's kingdom on earth. But this is only the beginning of Matthew's gospel. This is only the launch pad from which his audience learns the nature of Jesus' mission. Matthew is not interested in having the gospel of King Jesus remain in the narrative of Genesis. It's interesting what occurs immediately after Matthew's genealogy. 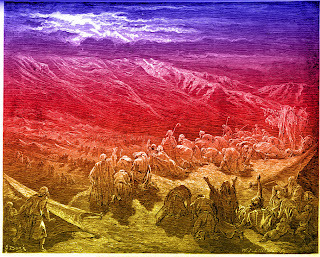 Matthew first provides us with a story about a man named Joseph in whose dream the Lord speaks and directs to adopt Jesus as his own firstborn son; and then that narrative is followed by magi (foreign representatives of other nations), and then finally by Herod ordering the little children in Bethlehem to be killed. Although many commentators focus mainly upon the birth narrative of Jesus in the opening chapters of Matthew and how it harmonizes with Luke's account, such a narrow focus is likely missing Matthew's main point. I recommend that before diving into a discussion about harmonizing the birth of Jesus with Luke's gospel, it's probably best to zoom out a bit and see the much larger picture being painted for Matthew's audience. Remember, I have already discussed in previous posts the way Matthew's gospel begins and ends. It begins with Genesis and ends with the last book of the Hebrew Scriptures. In Matthew's eyes, that is the farthest his audience could "zoom out" to view the entire scope of his Gospel. But for now, in this post, I'm recommending that we only zoom out a little -- just enough to cover the first few chapters where we find explicit thematic and textual parallels between Israel's birth and Jesus' birth (i.e. as the Father's "firstborn son", Exod. 4:22; Hos. 11:1), and between Israel's exodus and Jesus' exodus. And what do we find Jesus doing immediately after Matthew finishes this birth and "exodus" narrative? We find Jesus ascending a mountain to receive God's Law and deliver it to the people of Israel, just as Moses did (cf. Exod. 19ff with Matt. 5-7). These explicit literary connections (especially the quotation of Hos. 11:1 in Matt. 2:14) must be more intentional and calculated than what ordinarily meets the eye, and certainly much more than coincidence. And to a Palestinian Jewish audience, which myself and many scholars contend was Matthew's intended audience, there is no way this would have been viewed as merely coincidental. What we learn from all of this is actually very important for understanding the rest of Matthew's gospel. In chapters one through seven Matthew portrays Jesus, using true historical facts of providence, as the greater "firstborn Son" of God. He is greater than Israel as a "son" because he is the faithful and obedient son par excellence; and Jesus is even greater than Moses because Moses was only a mediator of God's Law (and a sinful one at best), but Jesus is the actual lawgiver and source of Divine Law.